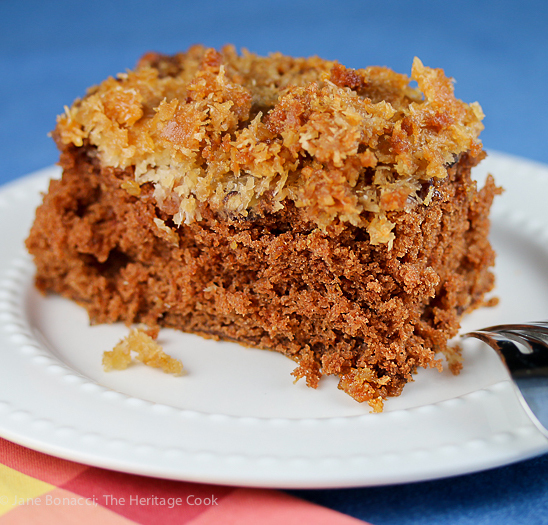 It is no secret that I love coconut and this Cockeyed German Chocolate Cake is no exception. Loaded with flavors of coconut, chocolate, and nuts, with caramel notes, this is a winner! One pan cakes are the simplest to put together and a snap to make. They are the perfect project for young bakers where they will learn valuable lessons and gain confidence. You can chop the pecans for them if you don’t want them handling knives yet. This cake is slightly more complicated than using a box mix, but still easy to make. You put the “topping” ingredients in the bottom of the baking pan then pour the cake batter over it. Once it is baked and cooled slightly, you invert it onto a plate so the coconut/pecan mixture is on top. That’s why I called it “cockeyed”!! Mine stuck to the pan pretty badly so the top isn’t as pretty as I would like in the photos, but it sure tastes good! I added the direction to line the baking pan with parchment so your should release a lot more easily and cleanly! The recipe will fill a 9-inch square pan more than halfway. I was concerned so I put the baking pan on a sheet pan to catch any drips. I was delighted to see the cake rise perfectly with no spillage! A 10-inch round would give you more headroom but the final cake won’t be quite as tall. This cake really delivers – all the flavors of a traditional German chocolate cake without the hassle of making layers and frosting them. My father-in-law begged for the leftovers after dinner – always a good sign! I hope you make this Cockeyed German Chocolate Cake and enjoy it as much as The Artist, his dad, and I did! Happy Chocolate Monday! Use your favorite cup-for-cup style gluten-free flour blend or you can use the one I made and use for everything from bread to cakes. I always use Authentic Foods Superfine flours so there is never any grittiness in any of my baked goods! Butter a 9-inch square baking dish or 10-inch round cake pan. Line the pan with parchment. Preheat the oven to 350°F. Make the Topping: In a medium saucepan, place the brown sugar and butter. Heat over medium-low heat, stirring until the sugar is dissolved and all the butter is melted. Pour into the prepared baking dish. Sprinkle the pecans and coconut over the butter and sugar. Drizzle with the milk and set aside. Prepare the Cake: In a microwave-safe bowl, melt the chocolate chips. Heat in 30-second bursts, stirring between each heating, until the chocolate is nearly all melted. Remove from the microwave oven, set aside to cool a little, stirring occasionally to be sure all the chocolate pieces are fully melted. In a bowl, combine the flour, baking soda, baking powder, and salt. Whisk until completely incorporated. In the bowl of your standing mixer, cream the butter and sugar together until light and fluffy, 2 to 3 minutes on medium-high speed. Add the eggs and vanilla, beating until smooth. Pour in the melted chocolate, beating until blended and there are no streaks in the batter. Gradually add the flour mixture, alternating with the buttermilk, to the mixer, beating after each addition. Start and end with the flour mixture. Scrape the bowl periodically while beating. Pour the batter over the frosting layer. Press into the corners and smooth top with a spatula. Transfer to the hot oven and bake for 40 to 45 minutes or until a toothpick in the center comes out clean. When done, remove from the oven and set on a wire rack for 15 minutes to cool slightly. Run a knife around the edges of the cake to loosen it, set a plate or baking sheet over the top of the pan and using hot pads, invert the pan and plate together, flipping the cake upside down. Ease the pan off the cake, carefully remove the parchment paper, and repair any disturbed areas. Do not wait more than the 15 minutes to get the cake out of the pan. If it sits too long the caramel in the topping will get firm making it much more difficult to get the cake to release. Adapted from Sara of Cook with Sara!